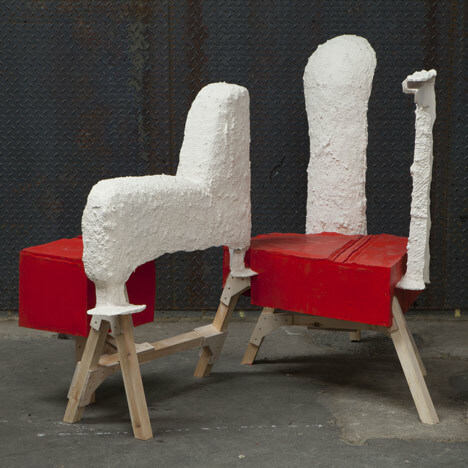 Royal College of Art graduate James Thompson cast the spaces between objects in the college cafe and used the resulting shapes to make furniture-like sculptures. Thompson mapped the spaces between objects like armchairs and pool tables using Jesmonite, which is typically deployed to create decorative mouldings. The resulting sculptures are mounted on wooden structures to resemble a new interior based on the same spatial relationships. Thompson graduated from the college's Design Products course and Parallel Architecture is on display at Show RCA 2012 until 1 July. Last week we published a movie with Design Products course leader Tord Boontje giving a tour of the show – watch it here. My work deals with our perception of space and its interpretation. My approach draws inspiration from the description of space in cubism and the potential duality of space and time, composed of parallel worlds and higher dimensions that exist alongside our own. Documentation is a key feature of my work, used as a working methodology and an outcome itself, evidenced through the creation of a tools and a systems used to record, re-map and translate a given space into something else. Design a system that can be used to document and re-map a particular space and time, to define new interior pieces. The work uses the current formation of a space, the RCafe at the RCA, as the start point to build a functional parallel interior, from that space, for that space. Cast jesmonite paths map the space, illustrating distance by creating connections between objects, these connections relay on each other for support, they cannot stand alone. The casts used describe space at that particular time and are used to influence to shape of the other, parallel re-constructed space they will become. In the re-constructed space these negative in-betweens are then filled and populated to bridge this gap and give new function to this empty space.